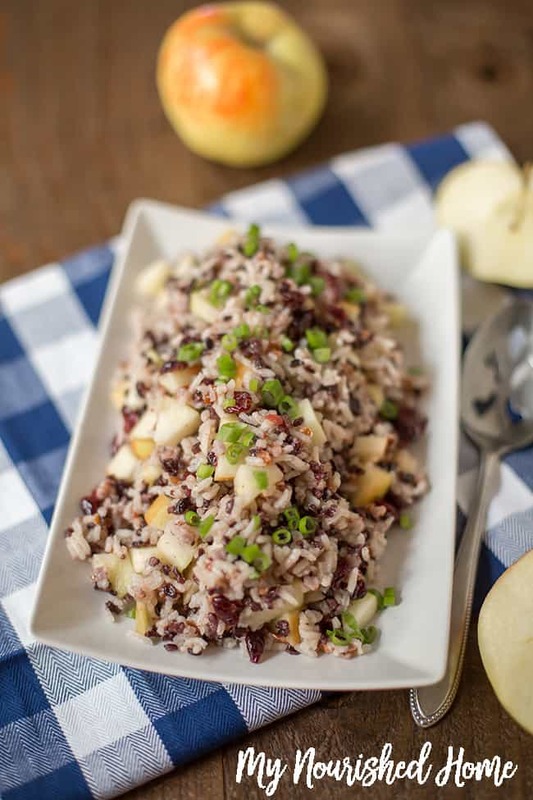 We partnered with Chelan Fresh to create this Apple Cranberry Rice Pilaf for your table. It is a perfect seasonal side dish – both sweet and savory. It is delicious with baked chicken, fish or pork. You can even dice up the chicken and toss it with the rice pilaf for a healthy lunchbox idea. If you have never made rice pilaf on your own, you are missing out on a simple side that is beyond delicious. 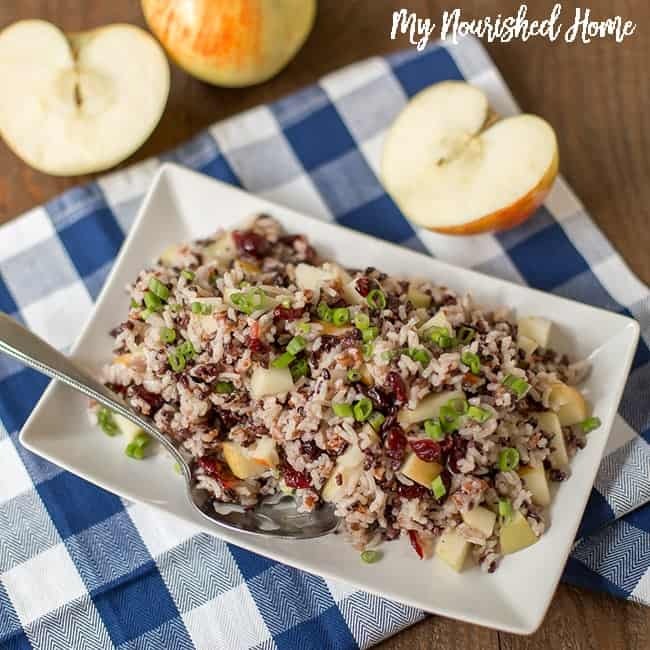 This Apple Cranberry Rice Pilaf makes the most of the apple season by blending sweet Honeycrisp Apples with tart cranberries and various textures and flavors of rice for an intriguing and delicious side to any meal. I actually love to serve it with a simple baked chicken – mostly because all of my kids get excited about it. At the end of the meal, I dice up the leftover chicken and toss it with the leftover Apple Cranberry Rice Pilaf to pack in their lunches the next day. While my oldest has no problem finding utensils at school, my younger kids have not quite mastered the art of cutting into bite size pieces and the extra step lets them take a hearty and healthy lunch to school the next day. Honeycrisp and Fuji Apples are our family favorites and this recipe works great with both varieties. Our friends at Chelan Fresh grow about a dozen varieties of apples that are eaten around the world – and are probably on your grocery store shelf. They also grow some of the sweetest cherries I have ever tasted and several varieties of pears. All of Chelan Fresh fruit is grown and hand-picked on family farms in North Central Washington. And the company supports efforts like the collaboration with Sesame Street to put fun characters on healthy fruits and vegetables to attract young kids. And they support Fuel Up to Play 60, a program that empowers youth grades K-12 to improve their nutrition and increase physical activity for their own healthy and well-being. We have a running joke at our house that we can put off going to the grocery store until we run out of any of these three things: milk, bananas, or apples. In addition to cooking with apples a lot, it is also a go-to snack for literally everyone in my house. As long as the fruit bowl is full, we will all grab an apple on the way through the kitchen instead of a less healthy snack – and apples are the fruit that everyone can agree on. 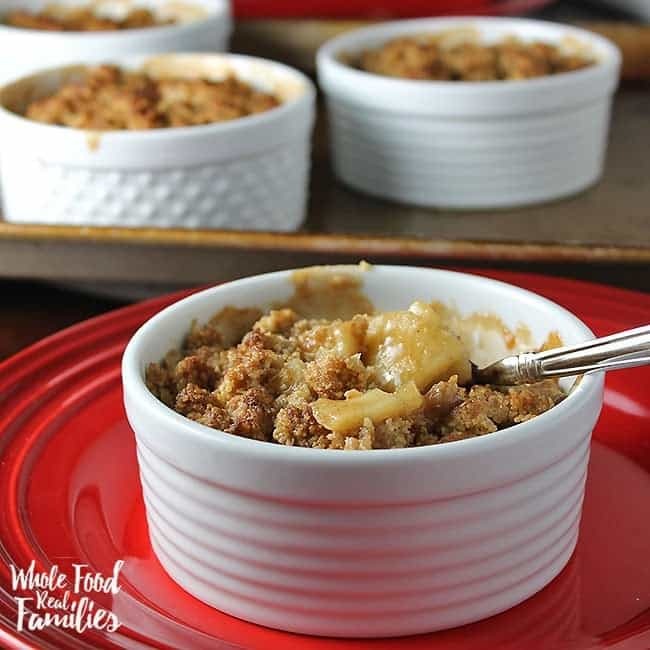 Check out my favorite Whole Grain Apple Crumble here. 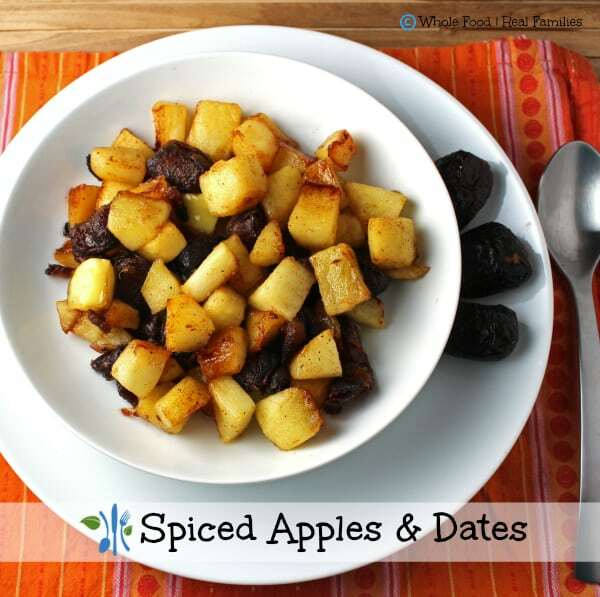 Or these Spiced Apples and Dates. We love serving them for breakfast or with dinner! Or follow Chelan Fresh on Pinterest! They have beautiful boards full of recipes that you will love! First, cook the rice (separately) according to package directions, using chicken stock instead of water. Meanwhile, melt butter and sautee the apple and onion until soft, for 3 or 4 minutes. Let them cool. Once the rice is cooked, combine all 3 different kinds of rice in a bowl and mix gently. Add the apple and onion mixture, and the cranberries. Toss until combined. Check for seasoning, you may need to add salt - depending on how you seasoned your rice originally. Sprinkle the scallions on top of the rice before serving. You may substitute your favorite wild rice for the seperate rices if you prefer. I love this! Would love to pair this with my favorite salmon or pork recipe. 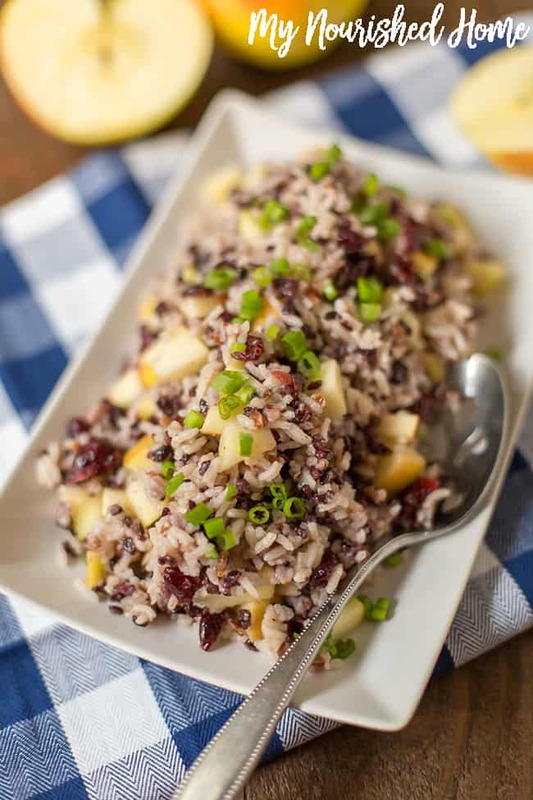 I would definitely would love to try the Apple Cranberry Rice PilafI think it is a great plate, of which it’s on my menu later in the week. This looks so fresh and delicious. Definitely bookmarked. I have never made black rice . This recipe sounds delicious and interesting. I like the combination of sweet and savory. I might add some celery or nuts for some crunch. These recipes look amazing. I recently bought Honey Crisp apples and these would be great to try them with! Thanks! 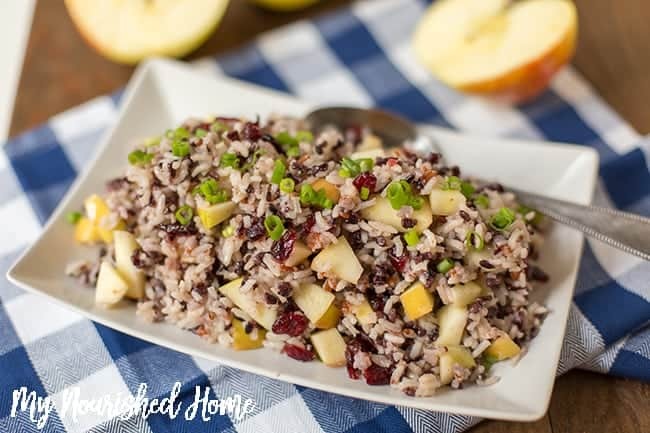 Apple Cranberry Rice Pilaf looks like a healthy and delicious side dish for autumn and winter meals. I love this recipe, cranberries are one of my favorite things. We like apples and cranberries. This does sound like a tasty side dish. I’ve made brown rice with cranberries and almonds before. That was good, but this looks even better with apples! I love cranberries! Looks yummy!